As is often the case, even in so-called free countries, restrictions on what one can describe in print is less restrictive than what one can show on film. Films such as Naked Lunch and Last Exit to Brooklyn seem bowdlerized when compared to their original texts. In East Germany, there are some perfect examples of this. Manfred Bieler’s Maria Morzeck oder Das Kaninchen bin ich was a popular book that didn’t meet any resistance until Kurt Maetzig turned it into a movie (The Rabbit is Me), and Horst Bastian’s Die Moral der Banditen (Outlaw Morality) was a successful novel, but was rejected as a movie premise when Rainer Simon presented the idea to DEFA back in the sixties. It would take another ten years before it was put on film. Likewise, Paul Kanut Schäfer’s Jadup did not merit much scrutiny as a book, but was immediately banned when the story was put on film as Jadup und Boel. Benno Pludra’s Insel der Schwäne (Island of the Swans) was a popular teen novel in East Germany, and was often assigned as reading in schools. But when director Herrmann Zschoche went to film it, he immediately ran into problems. The story was seen as an attack on the way the people in charge were handling the needs and requests of the children in the housing complex, and by proxy, the needs and requests of the general public. Zschoche had to rewrite several scenes and inserts a few others to keep the film board happy. The resultant film is still strong, but varies in many key areas from both the book and the original screenplay. Swan Island is the story of a young man who moves from an idyllic location beside a rural lake to one of the new Plattenbauen that were being built in the Berlin suburb of Marzahn in the early eighties. These Plattenbauen were intended to represent pinnacles of socialist community planning and forward thinking, but, as was so often the case in the later years in East Germany, the system’s ever-growing bureaucracy became its own worst enemy. Compromises to the ideas of the Marzahn communities were made every day until the final result was a pale shadow of the ideas and ideals of the original planners (for a great examination of this process see Peter Kahane’s The Architects). The story centers around the teens living in the housing complex and their attempts to have some influence over the features of the complex’s playground. In this respect, the film is slightly reminiscent of Jonathan Kaplan’s Over the Edge, in which teens in a U.S. planned community go on a rampage because of the lack of recreational facilities available to them. That film is based on actual events in Foster City, California. Clearly, adults not listening to the needs of children is, by no means, exclusive to any one country. Swan Island is directed by Herrmann Zschoche. Zschoche had already demonstrated his knack for working with teens in his classic Seven Freckles, but while that film dealt with the simple dynamics of young love, Swan Island has bigger fish to fry. For this film, Zschoche turned to his old screenwriting partner, Ulrich Plenzdorf. Zschoche and Plenzdorf first worked together on Karla, one of the DEFA films that was infamously banned after the 11th Plenum. It would be a few years before Plenzdorf was invited back to work at DEFA after that, eventually scoring a big hit with his work on The Legend of Paul and Paula. Likewise, Zschoche found his career momentarily stalled after the Plenum, returning to the director’s chair in 1968 with Leben zu zweit, a safely inoffensive comedy. Zschoche joined forces with Plenzdorf again in 1974 with Liebe mit 16. The main character, Stefan, is, to put it bluntly, a bit of a pill. He spends most the film with a glum expression, longing for his previous existence at his grandmother’s house at Swan Island. Not even the perky enthusiasm and budding sexuality of Rita and Anja, two girls in his class, can do much to lighten his gloomy demeanor. Besides his desire to see a good playground built at the construction site, the only other subject he shows any enthusiasm for is the defense of Hubert, a nerdy sad sack who is constantly under attack by a bullying older boy referred to only as “Windjacke,” so named for the windbreaker he always wears, which features an embroidered dragon on the back. 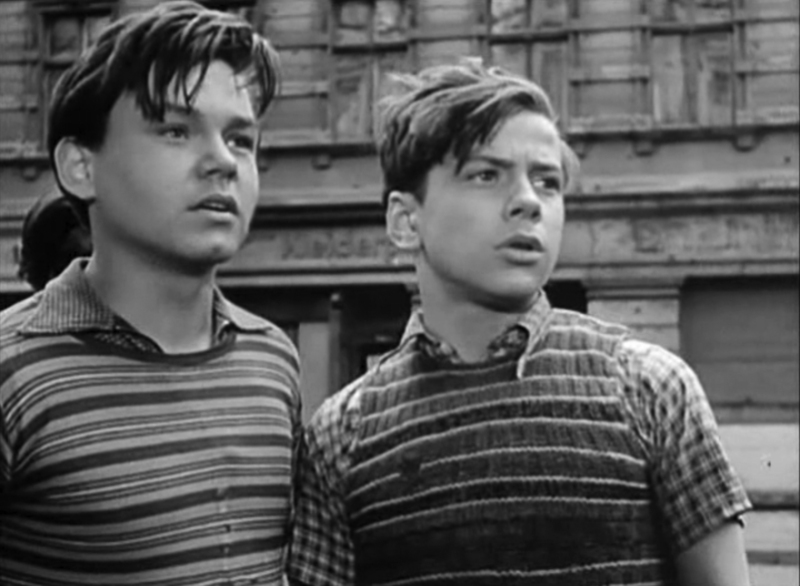 Most of the kids in this film did not go on to have careers as film actors. Axel Bunke, who plays Stefan, went on to become a successful sound engineer at Deutschlandradio, and now goes by the name Axel Sommerfeld, having taken the unusual step of adopting his wife’s last name when he married. Mathias Müller had appeared in two TV movies prior to Swan Island, but this film appears to have been his last. Similarly, Britt Baumann, who plays the sultry Rita did one TV movie after Zschoche’s film, but nothing further, and Kerstin Reiseck, who plays the perky Anja did not pursue a career in film. Swan Island was met with criticism from the establishment and mainstream critics. One of the film’s biggest opponents was film critic, Horst Knietzsch, who railed against the film as an unfair portrayal of Marzahn as a concrete wasteland. Others felt that the compromises made to the novel, like the compromises made by the adults in the film, ruined the story. After the Wende, Marzahn gained a reputation as a place to be avoided, filled with neo-Nazis and thugs. In fact, Marzahn’s demographics still skew more to the left than most of Berlin’s other districts, and the buildings, in spite of all the compromises have certain beauty to them that combines the aesthetics of Modernism and Russian Constructivism. The picture I use for this blog’s logo is of the old Soyuz cinema in Marzahn. 1. My attempts to find out more about this band yielded no results and nothing shows up in the Amiga catalog. If anyone has information about this group, please either contact me or add a comment to this post. 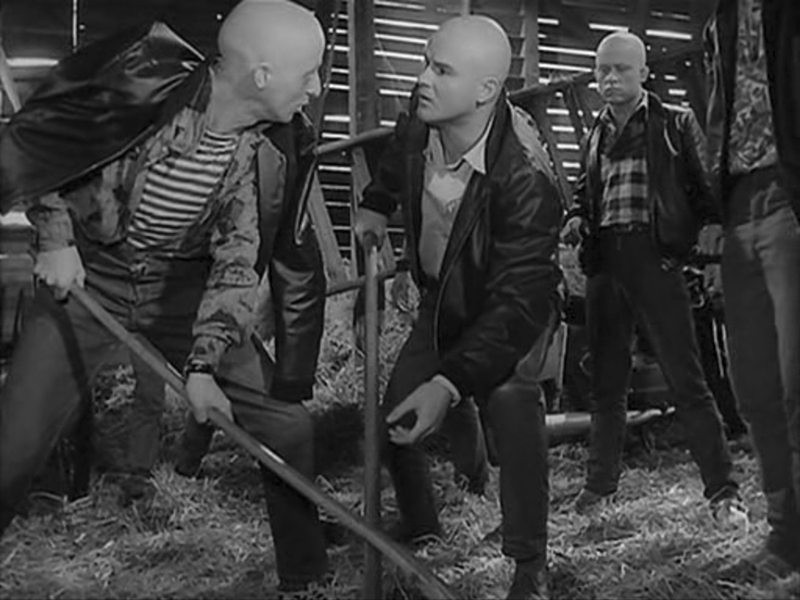 The Baldheaded Gang (Die Glatzkopfbande) is East Germany’s only biker film, and a possible precursor to the skinhead movement. Made in 1963—a full three years before Roger Corman kick-started the biker genre with The Wild Angels—the film follows the story of a gang of bikers who cause trouble at a vacation spot on the Baltic Sea. In this respect, it resembles Laslo Benedek’s classic The Wild One. Like The Wild One, it is based on an actual event; and also like The Wild One, the true story is far different than the one portrayed on screen. The film was made shortly after the wall went up and was intended to demonstrate how the wall would protect the citizens of East Germany from West German carpetbaggers. This was a common theme in DEFA films at that time. The villain in the movie is a man called “King,” an ex-foreign legionnaire who hails from West Berlin (of course). King leads a motorcycle gang whose shoddy work at a construction site was responsible for the deaths of two people. A police lieutenant named Lothar Czernik is called onto the case. Czernik is an odd bird. He seems to have a strange three-way relationship with his pretty next door neighbor, Marianne, and his dog: an enormous German Shepherd that often steals the show. The dog hangs around with the woman during the day, and then returns home to Czernik for dinner. Rather than simply cross the yard to visit her, Czernik likes to call Marianne on the phone and stare at her through the window. He also likes to let the dog bark at her over the phone. This is one of those movie relationships that aims for cute but achieves disturbing instead. The Baldheaded Gang gets off to a rollicking start with Helmut Nier’s percussive jazz score over artfully jagged titles, followed by a gang of motorcyclists tearing down a country road. Contrary to many descriptions of this film, the gang members are not riding mopeds, but their little bikes aren’t exactly Harleys either. At the beginning of the film, the gang members are hirsute, but later shave their heads in imitation of King’s personal hero, Yul Brynner. At the seaside resort of Bansin on Usedom, an island in the Baltic Sea, the gang proceeds to piss off everyone in sight, kicking over children’s sand castles, interfering with various games, and generally acting like your standard biker bad boys. During an evening affair at the local rec hall, the gang’s behavior leads to a fracas that quickly gets out of hand. Later that evening, after assaulting two vacationers who have been dogging them since the beginning of the movie, the gang learns what happened at the construction site and tries to get out of the country, only to find the way blocked thanks to the valiant efforts of the GDR to protect their borders. The film was a hit when it was released, and went on to become one of the most popular films in DEFA’s history. To the dismay of the authorities, some teens seemed to miss the cautionary point of the tale and identified with the troublemakers. 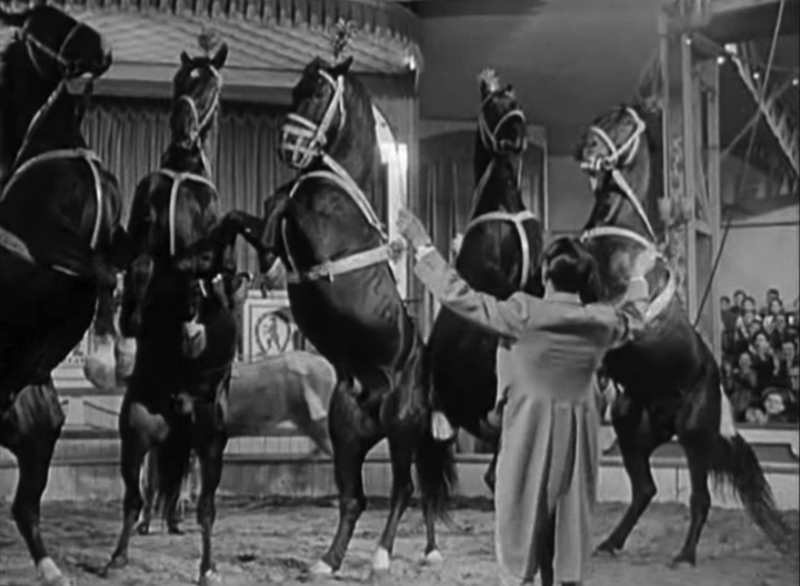 As a result, the film was eventually pulled from theaters in spite of its popularity. Whether or not any young rebels were inspired by the film to shave their heads and act up is not documented, but could it be that this minor spate of GDR rebelliousness trickled through the underground, surfacing in England in the late sixties as the skinhead movement? It certainly seems plausible. Although you can make a strong case for this film being the precursor to the entire biker genre, in style it is closer to the juvenile delinquent films of the fifties. For one thing, it is black-and-white with a bebop jazz score. It would take Roger Corman with Dave Allen and the Arrows to add electric guitars to the sounds of motorcycles. For another, the perspective is that of the authorities. Very little is done to build sympathy for the gang members. Only the spineless Piepel arouses any sympathy for he has paid the highest price of all. As the evil “King,” Thomas Weisgerber is effectively menacing. Particularly interesting is Rolf Römer, playing Johle—one of the odder, more aggressive members of the gang. With hair, Rolf Römer resembles Cash Flagg (Ray Dennis Steckler) of Incredibly Strange Creatures fame, but without hair he looks like Michael Berryman in The Hills Have Eyes. Also worthy of note is Irene Fischer, who plays the peroxide blonde, Jackie to slatternly perfection. She would be right at home in any juvenile delinquent film from the United States. Although the movie is based on an actual event, the true story is far different from the one portrayed on the screen. In reality, the event took place a few days before the wall was built. Seven young men were arrested for playing rock’n’roll, which was seen by the authorities as a threat to civilization (the word Unkultur gets bandied about here, but it doesn’t translate well). Five of the young men had shaved heads, but they did not know each other. After their arrest, the people at the Bansin campground marched to the police headquarters. Some were there to protest the arrest of the men, but most were there to complain about the lack of amenities. The authorities over-reacted (as authorities often do) and the men were charged with an attempted putsch—a word laden with sinister overtones thanks to Adolph Hitler. The fact that five of the men had shaved heads attracted the media’s attention and they become known as die Glatzkopfbande. The court was hard on them, sentencing them to 27 years altogether, with eight years for the main defendant. After being released from prison, some of the men did exactly what their characters in the film were trying to do: they went west. In 1965, Richard Groschopp followed up the film with Entlassen auf Bewährung (Released on Probation), which continues with the story of Conny Schenk, a peripheral character in The Baldheaded Gang, who initially abets the gang but then later helps the police run them in. In 2001, the 45-minute documentary film about the actual incident—»Revolte« am Ostseestrand (“Revolt” at a Baltic Sea Beach) by Jürgen Ast and Inge Bennewitz—was shown on German television. In 2004, Vorpommern Theater produced Glatzkopfbande. Erinnerung an Rock ’n’ Roll (The Baldheaded Gang, a Memento of Rock’n’Roll), a theater piece based on the story. By the time DEFA was founded, Richard Groschopp had already made a name for himself filming documentaries and training films for the Third Reich. As a cameraman, he worked with Leni Riefenstahl on her classic, Olympia. After the war, he started with DEFA by making short films. During the fifties he helped create the “Das Stacheltier” group, which specialized in producing short, humorous films that were shown along with newsreels before the main features at cinemas. Groschopp began directing feature films in the late fifties and had a big hit with the romantic comedy, Die Liebe und der Co-Pilot (Love and the Co-Pilot). But his biggest hit came in 1967 with the Indianer classic, Chingachgook, the Great Snake. This would be his last feature film. After a few TV movies, Groschopp retired in 1971 at the age of 65. He died in 1996. Whether there are any plans to release this film in the United States, I do not know, but I certainly hope so. This film has been missing from the biker film narrative for too long. 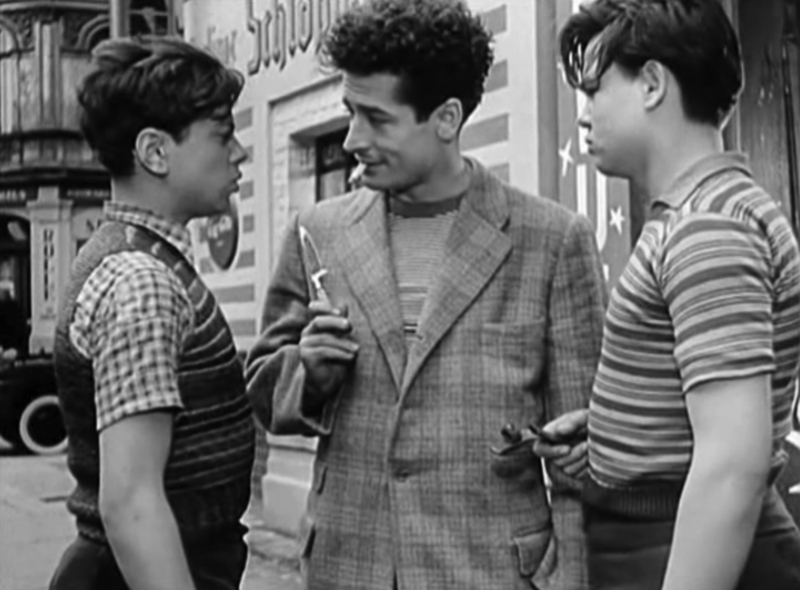 A year after Blackboard Jungle, West Germany added its own contribution to the genre with Teenage Wolfpack (Die Halbstarken), starring a young Horst Buchholz. As with its American predecessor, Teenage Wolfpack was met with protest and trepidation from the general public. It seemed that any attempt to portray the behavior of teenagers was viewed as provocative and liable to spawn further trouble. A year after Teenage Wolfpack was released, East Germany jumped on the bandwagon with the release of Berlin Schönhauser Corner (Berlin – Ecke Schönhauser). Up to this point, East Germany was usually ahead of the west when it came to topical subject matter, but things were changing, Finally the west was moving away from the endless parade of Heimat films that bombarded the western cinemas for the first half of the fifties, and were willing to explore subjects a little more topical than Bavarian alpine romance. As with its western counterparts, Berlin Schönhauser Corner was met with considerable resistance. East German authorities were worried that the film might help provoke more youthful unrest. Eventually the film was released and was a hit. Berlin Schönhauser Corner is the story of four aimless young people. Dieter (Ekkehard Schall) is the oldest of the bunch, and, as the brother of a policeman, he gets away with more than most of his comrades. Angela (Ilse Pagé) is a restless young woman who is sweet on Dieter. Kohle (Ernst-Georg Schwill) is the hapless little friend who adores Dieter and stays away from home to avoid being beaten by his stepfather. Karl-Heinz (Harry Engel) is the bad egg in the bunch, and clearly the product of a more privileged upbringing. When things get too hot for them in the east, Dieter and Kohle flee over the border to the west, only to find that things there are no bed of roses either. In spite of the criticism of modern youths, the film stays true to its communist principles. The bad kid, Karl-Heinz, clearly comes from a bourgeois environment, and the west proves to be worse than the east when it comes to civil liberties. The character of Kohle strongly resembles that of Sal Mineo’s “Plato” in Rebel Without a Cause. He is the perennial sidekick, doomed from the start by his need to belong. Much of the trouble that he gets into is centered around his desire to get a western Deutschmark that Karl-Heinz falsely promises him. In fact, nearly every problem the youths encounter is, in some way, related to the destabilizing effects of the west, whether it is the lure of quick gold from stolen identity papers, to the perceived desirability of the western Deutschmark. As a figure of rebellion, Dieter only just barely qualifies. He is older than his western counterparts, and he holds down a job at a construction site. 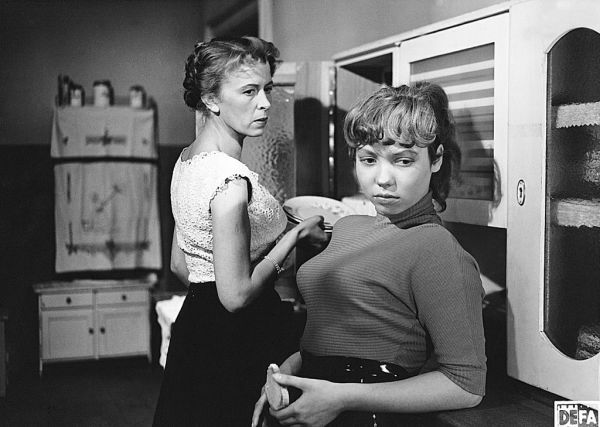 The closest character to a western teenager in this film is Angela who—with her tight sweater and conical bra—resembles every female American juvenile delinquent of the fifties. This is probably due in part to the fact that Ilse Pagé was from West Berlin and was chosen because she had the right look for the role. She had no previous acting experience and had to be coached on the set, much to the dismay of the GDR officials. Nonetheless, Ms. Pagé continued on her acting path, and went on to act in several more films in the west, including The Tin Drum (Die Blechtrommel) and Angels of Iron (Engel aus Eisen), for which she won a German Film Award. Ekkehard Schall continued making films in East Germany and was also well-known as an interpreter of Bertolt Brecht on stage. After the wall came down, he devoted his time to stage performance, appearing only once in a TV movie (Der Auftrag). Berlin Schönhauser Corner was a directed by Gerhard Klein and written by Wolfgang Kohlhaase. The duo often worked together, creating some of the best films to come out of East Germany. They met during the early fifties and together created the Berlin trilogy, of which Berlin Schönhauser Corner was the third installment. Nine years later, Klein and Kohlhasse wanted to further explore the subject with their film, Berlin Around the Corner (Berlin um die Ecke). Unfortunately for them, that was 1965, the year that the SED (Socialist Unity Party of Germany) held their infamous 11th Plenum, which came down hard against many films and books that were deemed to be “anti-socialist.” Berlin Around the Corner was one of those films, and work on the film was halted. Gerhard Klein was devastated by this decision and never completed another motion picture. He died in 1970 at the age of 50. Wolfgang Kohlhaase went on to write the screenplays for many more DEFA films. When the wall fell, he transitioned better than most to a unified Germany with such favorites as Volker Schlöndorff’s The Legend of Rita (Die Stille nach dem Schuß), and Andreas Dresen’s Summer in Berlin (Sommer vorm Balkon), which saw him return to his favorite subject: working-class Berlin. In 2010, he was awarded an honorary Golden Berlin Bear at the 60th Berlin International Film Festival.